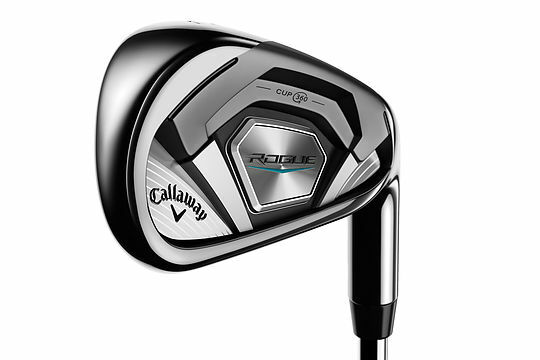 Callaway has unveiled the Rogue Irons, a four-product iron family packed with new innovations and advanced multi-material technologies. Overhauling how distance and forgiveness should feel, Rogue Irons push ball speed capabilities into previously unseen areas, creating a combination of distance, accuracy and playability never before experienced in a Callaway Iron. Golfers can choose from Rogue Standard (for balanced performance), Rogue X (for maximum distance), Rogue Pro (for better players) and Rogue Womens (for slower swing speeds). The key technology at the heart of the new Rogue Irons is Urethane Microspheres. R&D experts at Callaway found that high-COR iron faces promoting faster ball speeds are subject to a significant amount of vibration at impact, resulting in a harsh, ‘clicky’ sound and feel. Inserting a layer of soft material in the head has proven effective at absorbing vibration to improve feel, but with the unwanted side effect of slowing the face. Callaway solved this problem with a new urethane material infused with thousands of tiny air pockets called microspheres, which create porosity. Furthermore, multiple innovative clubface technologies work together to deliver more ball speed across a huge area of the face for more average distance. The enhanced 360 Face Cup employs a shallow, flexible rim around the perimeter that flexes and releases at impact to increase ball speed. Whilst Variable Face Thickness technology (VFT) influences how the face then flexes to promote more ball speed on off-centre hits. Finally, the metal-injection moulded (MIM’d) tungsten-infused Internal Standing Wave, first developed in the Epic Irons, located inside each head and twice as heavy as steel to concentrate weight in a specific area, allows precise placement of the CG for optimal flight and control. Dr. Alan Hocknell, Senior Vice President, Research and Development at Callaway Golf, commented: “The technical complexity of Rogue Irons propels performance into the unknown. We have created a new class of iron here, beyond anything launched at Callaway before. By placing key performance ingredients into an oversized Rogue X head with a longer blade and wider sole (pushing CG deeper and further back from the face), and coupling this to lighter shafts with stronger lofts, design experts have unlocked incredible ball speed and distance capabilities. Rogue Irons will be in store from February 9, 2018. Graphite and Pro will be priced at A$174.99 (NZ$219.99) and A$159.99 (NZ$199.99) for Steel.